It's that spooky time of the year again - Halloween! This year, the Halloween event is solving a problem with 'the entertainment' at Pumpkin Pete's party for Death. Note: This event was only available from 18 October 2010 until 1 November 2010. 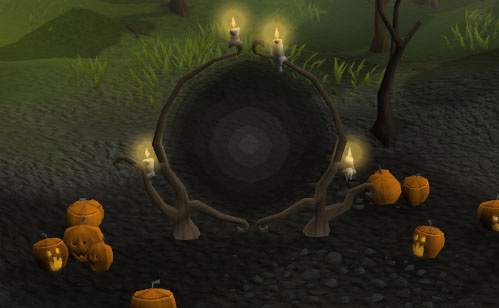 Death's house, through the Dark Portal located north-west of Port Sarim. 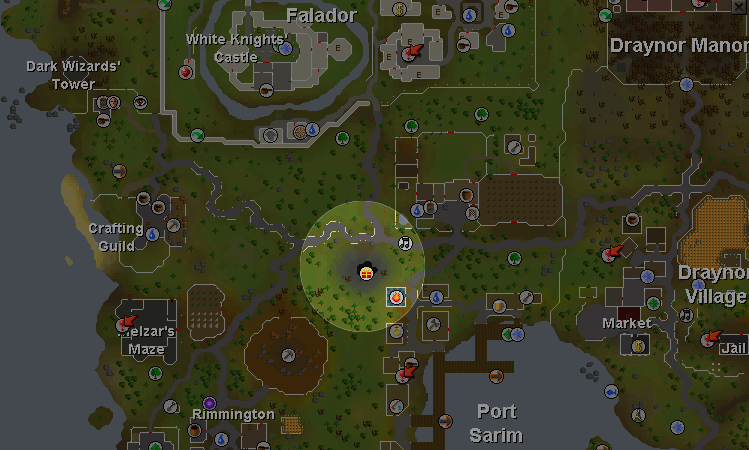 To get to Death's house, you will need to go to the black house portal located north-west of Port Sarim. There you will find a dark, glowing portal. Once you have arrived, start by speaking with Pumpkin Pete, the portal owner. Follow the conversation until you successfully start the event. Enter the portal, and you will find yourself in Death's house. 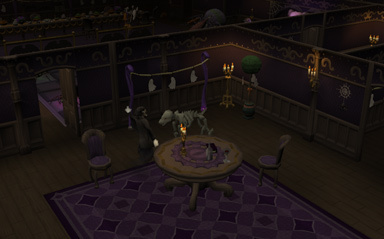 As you can tell from the decor, the house is ready for a fantastic party! But let's not get ahead of ourselves...Talk with Pumpkin Pete and he will tell you to ask people around the house if they have any problems. Head North of the dance floor to find Minstrel Web, the large spider in the bathtub. Ask Minstrel for help. She will tell you that there are eight spiders "hiding" somewhere. With all that great help, you obviously have no idea where you'll be going. Thankfully, you can find their locations below. 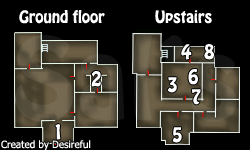 The location the spiders are located in is the number shown on the map. 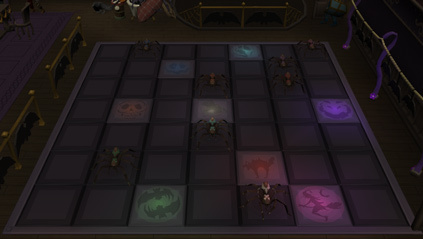 However, the specific colored spider's location changes depending on the person. The spiders do remain in the same places for all. 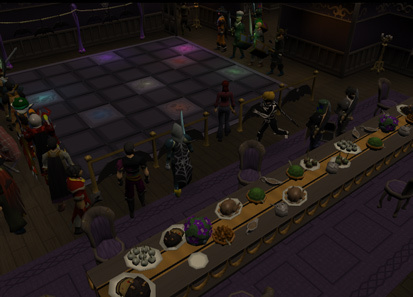 Purple Spider - It can be found in one of the cabinets near Pumpkin Pete. Orange Spider - "Interact" with the spider and it will leave. Pink Spider - "Interact" with the spider and it will leave. Beige Spider - "Interact" with spider and it will leave. Turquoise Spider - "Talk" with the spider first. Then "Scare" the spider and it will cease to have a conversation with Edgar. Blue Spider - "Search" the four poster bed. 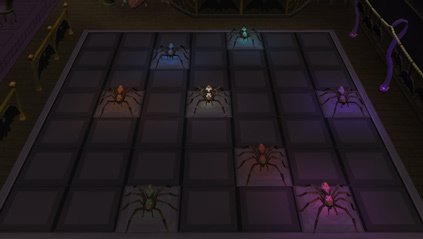 Note: These spiders wander, so they could be in slightly different locations than the ones listed above. Head back to Minstrel Web, who will give you instructions. You are going to need to move the colored spiders to the correctly colored floor tile. However, this is a puzzle and you need to move them in a specific order. If you make a mistake and need to reset the puzzle, talk to Allan (the Raven next to Minstrel Web) and he will reset them back to their original positions. Talk to Minstrel Web to make sure you've completed it correctly. Use the Pile of Evil Leaves on the Empty Moonshine Vial. Use the Big Bottle of Blood on the Strained Moonshine Vial. Use the Big Bottle of Fear on the Unfinished Moonshine. Use the Pile of Ground Bones on the Unfinished Moonshine. Talk to any one of the werewolves to give the Moonshine to them. Head back upstairs, and go to the far east room. Grim is excited that his favorite musician, Zabeth Corvid, is going to be at the party and is very anxious about it. You will offer to get the one thing Grim is missing in his memorabilia, an autograph. Grim said that when Zabeth Corvid died, he was drunk. This made him wander into the future. This means that you will need to reply with the correct statements he would have replied to in the last part of the dialogue. You can find him in the same room as Muncher, in the south-east corner of the house. Can I get an autograph for Grim? You will successfully get an autograph. Return to Grim and give him the autograph. While he decides where to put it, head back downstairs and talk with Pumpkin Pete. 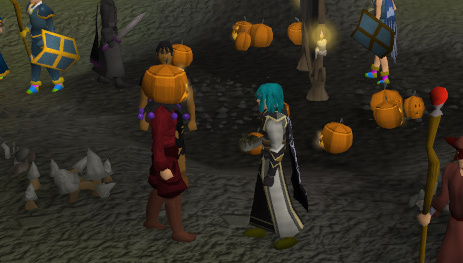 Pumpkin Pete will tell you that everything is done and then you get to watch a cut-scene of the party. 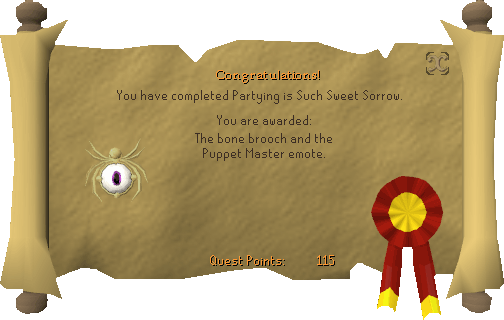 Once that's done, you have successfully completed the event. Congrats! Wearing this will make you turn into a pile of bones.